Unemployment for Singaporeans and permanent residents held steady after the first three months of this year in a patchy labour market that reflects the uneven growth in the economy. Official figures released yesterday show fewer workers lost their jobs. At the same time, the overall number of people employed in Singapore plunged, hitting a level not seen since 2003, during the severe acute respiratory syndrome outbreak. Work permit holders contributed largely to the drop, said the Manpower Ministry in its preliminary report on the Singapore labour market in the first quarter. For locals, including permanent residents, the seasonally adjusted unemployment rate last month was 3.2 per cent, unchanged from December last year. The labour market outlook is likely to remain uneven across sectors. Hiring in some sectors remains cautious, but opportunities will continue to be available in others, such as healthcare, infocomm, finance and insurance, and certain segments of manufacturing. 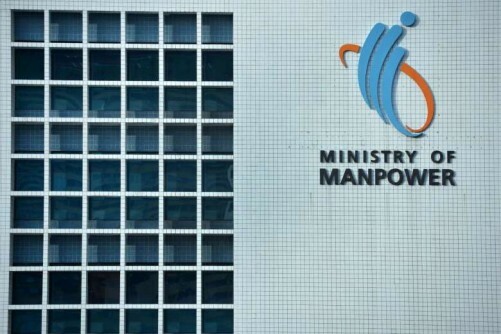 THE MANPOWER MINISTRY, in the preliminary report on the Singapore labour market in the first quarter. The rate for citizens also stayed put, at 3.5 per cent, after a sharp uptick in December from the September rate of 3 per cent. Overall, unemployment rose to 2.3 per cent, up from 2.2 per cent in December. The outlook for the global economy, however, has improved slightly this year. 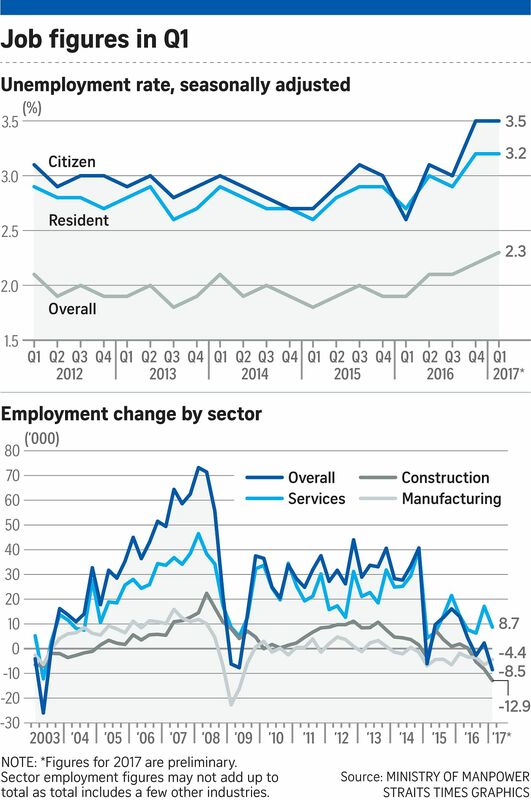 There is also a glimpse of a rebound in outward- oriented or trade-related sectors, fuelled particularly by growth in Singapore's manufacturing, according to the Monetary Authority of Singapore's biannual Macroeconomic Review released on Thursday. Citi economist Kit Wei Zheng, however, noted the latest labour figures suggest "stronger external demand in the past two quarters has yet to provide any meaningful uplift to labour demand, with even manufacturing continuing to shed jobs". Similarly, the Ministry of Manpower (MOM) cautioned that downside risks and uncertainties remain. It said: "The labour market outlook is likely to remain uneven across sectors. Hiring in some sectors remains cautious, but opportunities will continue to be available in others, such as healthcare, infocomm, finance and insurance, and certain segments of manufacturing." Recruitment firm Adecco Personnel's Singapore country manager Femke Hellemons said the bright spots for jobs are in the logistics and supply chain, e-commerce and technology sectors. Layoffs continued to remain high, though the number fell to 4,800 between January and last month, down from 5,440 in the previous quarter. But it is slightly higher than the 4,710 a year ago. Fewer workers lost their jobs in manufacturing, but more did in construction and services. MOM said redundancies are expected to remain high as some sectors go through cyclical weakness and businesses continue to restructure. As more work permit holders were sent home, total employment shrank, with 8,500 fewer workers in jobs at the end of the first quarter - the biggest fall in 14 years. Most of the losses were in manufacturing and construction. The service sector, however, continued to add workers. MOM said it has two priorities: first, to support out-of-work people or those at risk of losing jobs, through its Adapt and Grow programmes; and second, to work with the National Trades Union Congress (NTUC) and employers to help businesses be more productive. Labour MP Patrick Tay said in a Facebook post that increasing digital disruption has led to the creation of more jobs - but new types of them - in some sectors. "I urge workers and employers to stay ready, relevant and resilient - ready with new skills, relevant for new jobs, and resilient to new changes," said Mr Tay, NTUC's assistant secretary-general.